A General Election always opens the floodgates for random callers, ranting obsessives and those with an axe to grind. And with five constituencies worth, hardly five minutes pass without another call - which is not surprising given 350,000 people have just received a leaflet with our phone number on it along with an invitation to "call us with your views..."
The lady who said she knew all about the machine the government has to control the weather and how the weather is made extra cold during a recession as "a cold snap" kills off old people thereby reducing the burden on the state. Apparently this is the same whoever is in power - "you are all in on it." 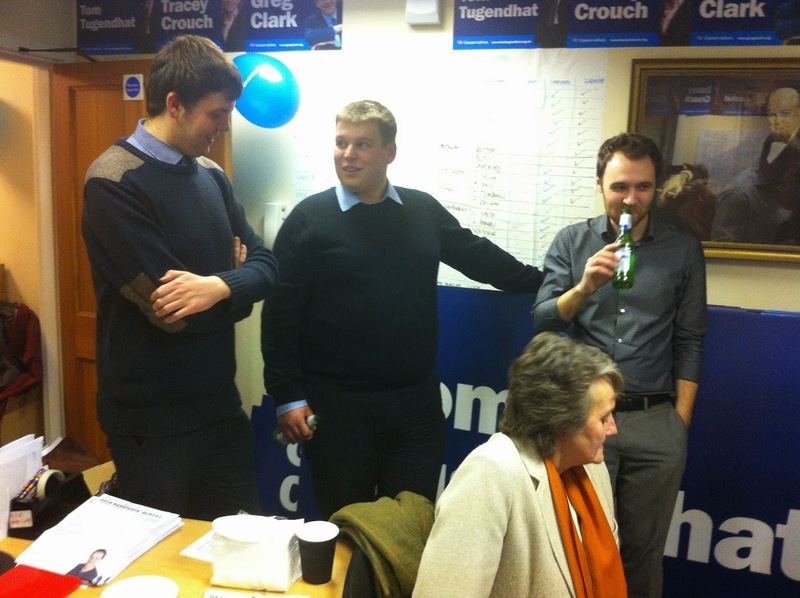 Then we had a nice woman who called to say she had received a letter asking if she could help with the campaign. One of the options was "delivering election leaflets to local houses" and she was curious about what "delivering leaflets" actually entailed. And then there was the angry woman who called to inform me she would never vote Conservative again after the government removed child benefit from higher rate taxpayers. Apparently she now has to help look after her grandchildren two days per week as the loss of child benefit resulted in her son and daughter-in-law having to let go of their nanny, as they couldn't afford her as well as the au pair. I did ask her if she thought basic rate taxpayers should pay more tax so her children could employ both a nanny and an au pair, but the point seemed lost on her. Finally there was the 73 year old lady from a small terraced house in Chatham who sent a postal order for £85 as a contribution to Tracey Crouch's election campaign. According to the handwritten note, Tracey had helped her with a problem late last year and had made a real difference to her life. The £85 was the contents of her 20p coin collection which she had been saving for "something special". I am not prone to sentimentality, but when I read the note I felt my bottom lip quiver. The donor received a handwritten note of thanks. 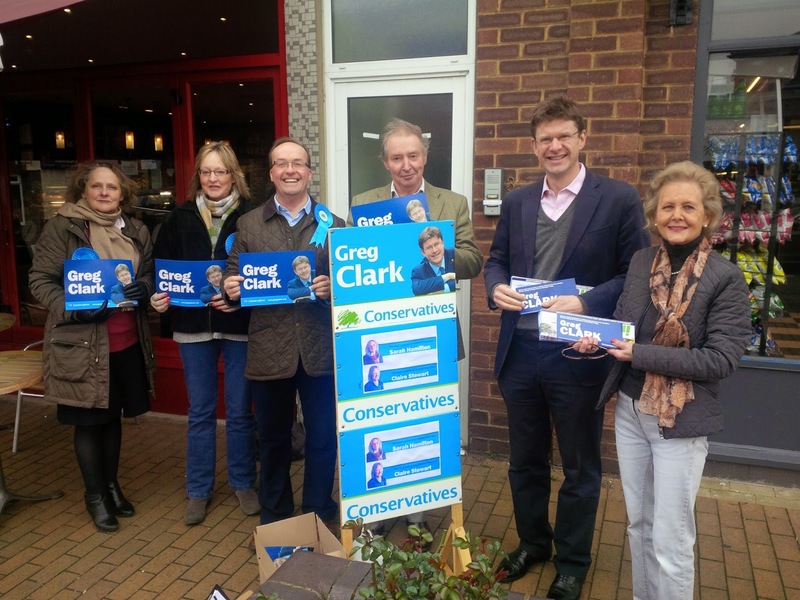 9.00am Heading off around West Kent to visit our amazing volunteers on the street stalls in all the major shopping centres and villages, no doubt meeting up with our parliamentary and local government candidates en route. Thanks to my partner Steve Browning for chauffeuring me (even if he did say it was like "Driving Miss Daisy"). 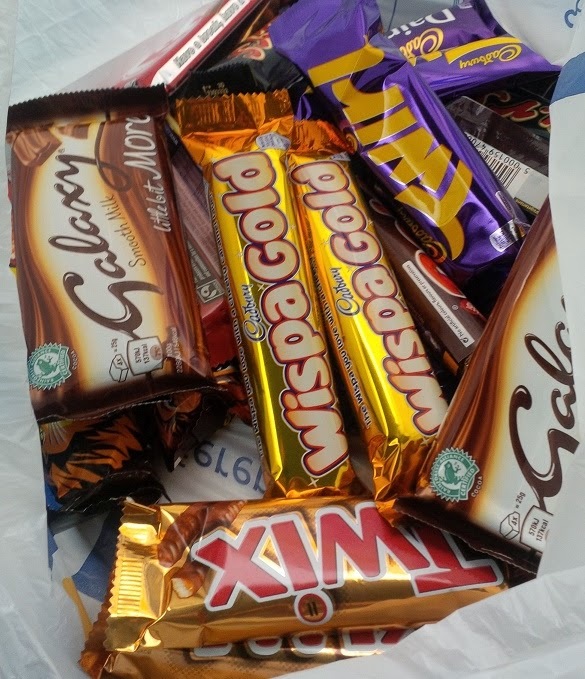 First stop my local newsagent to buy a bag full of chocolate bars to thank the helpers! 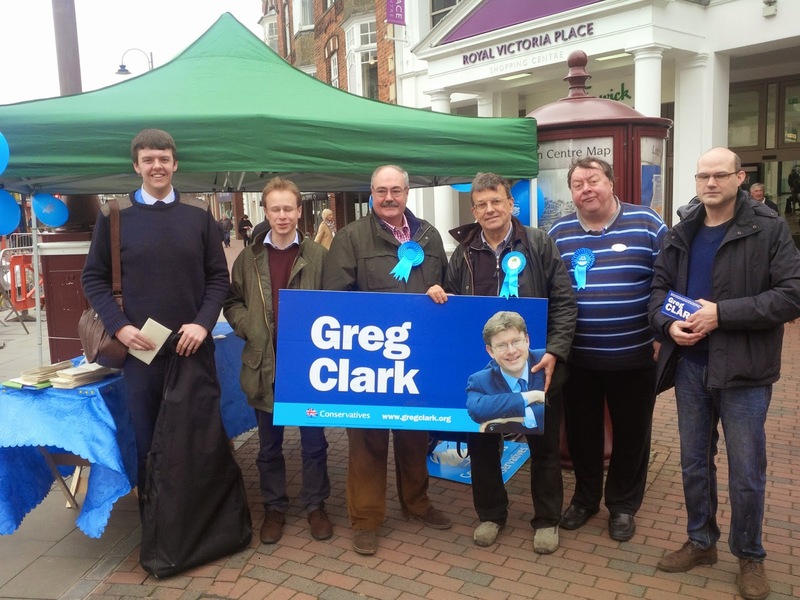 10.00am Great to meet Greg Clark and West Kent Chairman William Rutherford at the Paddock Wood Street Stall, ably organised by branch Chairman, Richard Jeffryes. Also present are our two Borough candidates Sarah Hamilton and Claire Stewart. Paddock Wood have located their stall directly outside Costa Coffee and have a constant supply of hot drinks. Wise move ! 10.45am: A brief stop to thank the team outside Royal Victoria Shopping Centre in Tunbridge Wells (below) who have erected a gazebo! Great to see local candidates David Elliott (Southborough North), Peter Oakford (St Johns) and Alex Lewis-Grey (Culverden) along with Bob Backhouse, Matthew Dickins and Liam Keeble. 11.15am Next stop Rusthall in the Tunbridge Wells constituency where a double local election allows us the opportuniity to rid the Borough of its two UKIP councillors. Great to see our two fabulous candidates Thelma Huggett and Joy Podbury. 12noon Arrived in Tonbridge where we have two stalls - one either end of the High Street. The first is being run by our local council candidates Jon Botten, Ben Elks and Russell Lancaster and is located in Botany (cue feeble joke about Botten and Botany). The other stall is on the bridge, next to the Christian Faith Healers! 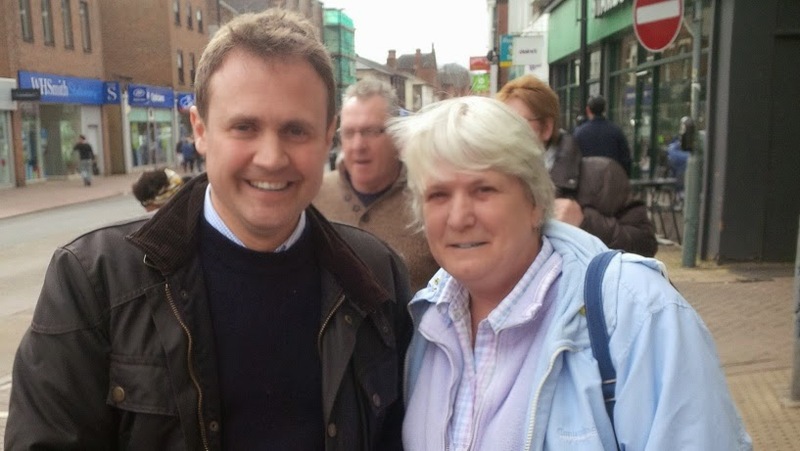 Whilst Tom Tugendhat and Matt Boughton march up and down the High Street mmeeting shoppers and residents. 12.45pm At Kings Hill to thank local candidates Piers Montague and Lee O'Toole who have distributed an amazing 2,000 leaflets outside Asda. Thanks also to one of our office stalwarts, Janet Sergison, who helped set-up and run the stall. Next stop West Malling to rendezvous with Association Chairman, Jacques Arnold. D-41 - Groundhog Day but we're all 5 years older! When the alarm went off at 5am I did ask myself "why", but the answer didn't take long to come. Because I suggested it - and there is no way I would ask our dedicated volunteers to get up in the dark and drag their weary bones to a railway station to hand leaflets to commuters if I wasn't prepared to do it myself. So I was up and showered and at just after 6am I was at Chatham railway station to meet Tracey Crouch and the team, with 1,000 leaflets and a cheery "good morning" for every commuter. It was however a feeling of deja vu as it was this day with the same candidate and the same feeling of nervous anticipation five years ago when we officially launched Tracey's first election campaign in 2010. My thanks to David Wildey, Simon Wray and Stephen Peachell who joined us this morning. Elsewhere in West Kent all was going to plan. 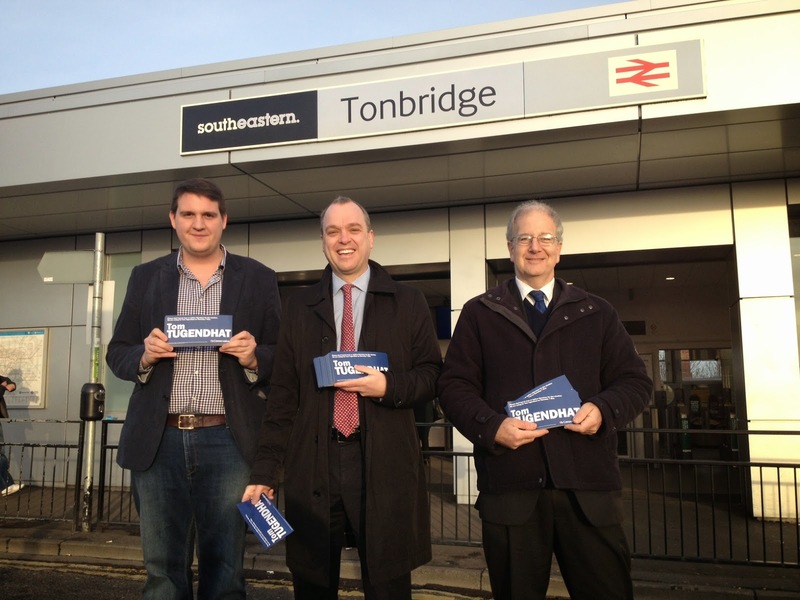 Here is the team at Tonbridge station at 6.30am (probably the first time Ben Elks has seen 6.30am and it not being on his way home). Thank you Ben Elks, Russell Lancaster, Michael Payne, Jon Botten (taking photo) and Nicolas Heslop (out of sight). And here is West Kent Chairman, William Rutherford with Natasha Rutherford and David Scott at Tunbridge Wells Railway Station at 7am. In total, we had 14 stations covered today. 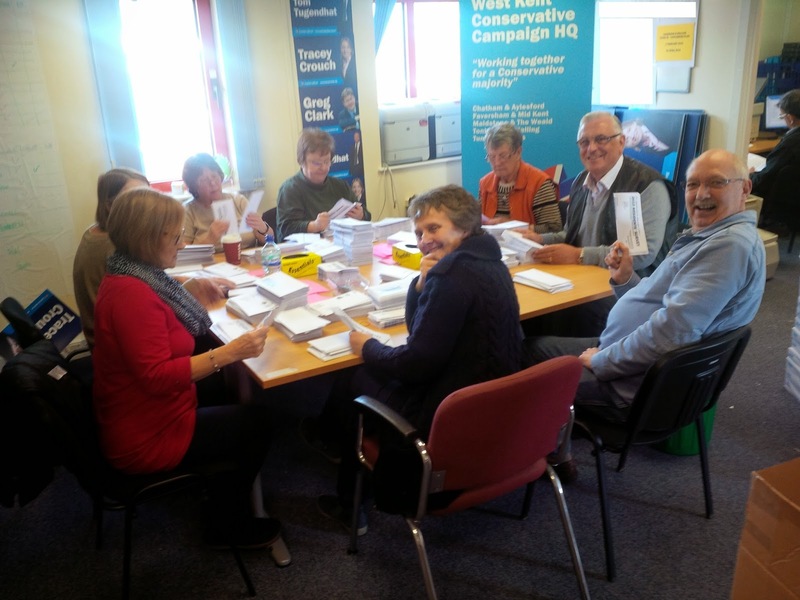 After meetings with the printer and the mailing house, it was back to West Kent Towers to thank the volunteers who were packing and data-capturing - then two hours working with Jon Botten catching-up with the 200+ emails which had arrived today. Finally with the help of Max (one of our team of data entry volunteers) we loaded up the van with 24 sacks of outgoing mail - the Fighting Fund Appeal! 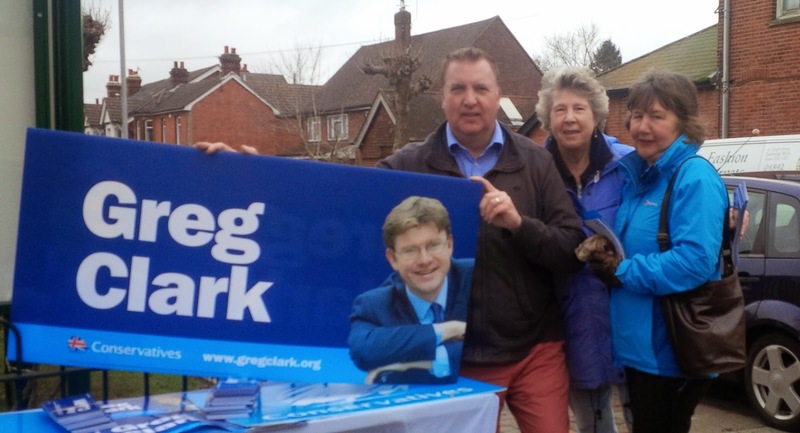 Tomorrow I will be "live blogging" as I dash around West Kent visiting as many of our 26 street stalls as time allows and thanking our volunteers for staffing them. Across West Kent we have over 200 activists at railway stations, bus terminals and high streets tonight, handing-out our campaign launch leaflet. 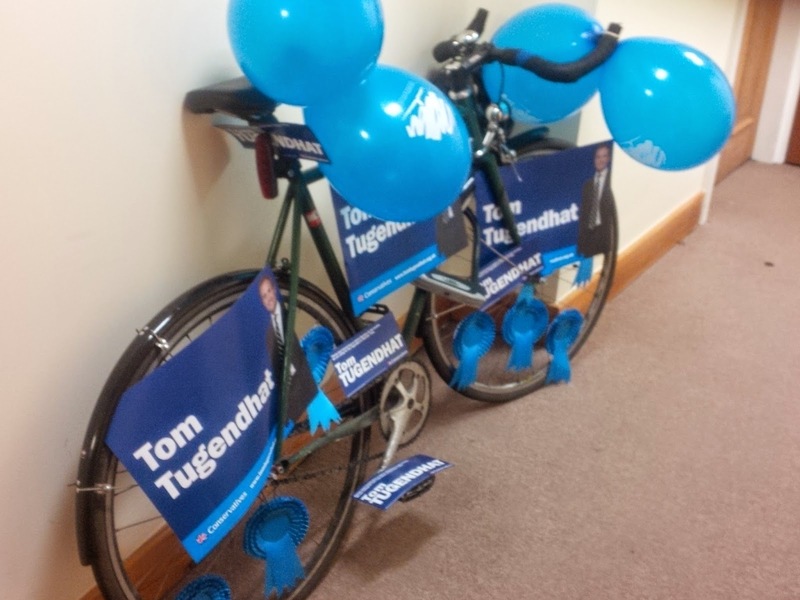 I am leaving the office now to join Tom Tugendhat and his team and will be up at 5.00am tomorrow to join Tracey Crouch. Let battle commence! 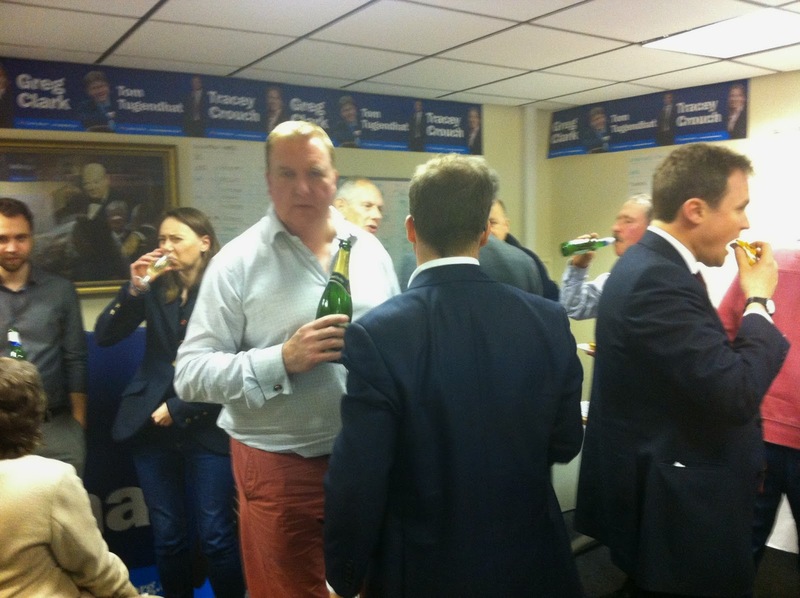 It felt like the "night before Christmas" at West Kent Towers this evening, when 30 of our office volunteers joined the staff for a pre-campaign reception. It was our way of thanking the team for all they have done and all I know they will do in the weeks ahead. In my speech I highlighted their amazing contribution to the smooth running of the campaign, including packing over 300,000 envelopes and data-capturing 77,000 pieces of information in the last 8 weeks alone. It is also worth noting that over the last 12 months we have provided over 2,500 "man hours" of Campaign Support to target seats including Newark, Clacton, Eastbourne, Rochester & Strood, Lewes, Hastings and Thanet. We have also donated in excess of £12,000 worth of design, printing and professional services to our target seats. Outing my new salmon pink trousers which, along with new puce ones (yet to be seen), have been specially acquired for the campaign ahead! Very good of Matthew Plummer to come down to help today - and we are delighted that he has donated his bicycle for use during the campaign. It will certainly attract attention in Tonbridge High Street with Matt Boughton riding it whilst shouting through a megaphone. There are times when the best thing to do is dispense with the flowery language and tell someone the facts - even if they would probably prefer not to hear them. I've just had the following telephone exchange with one of my Chairmen. "Hello Andrew, have you spoken to (name of candidate) recently?" Yes - we speak most days. "Do you know what I know?" If you tell me what you know, I can tell you if I know it too. I know lots of things about Wednesday - what exactly are you talking about? "Oh, if you don't know I cannot tell you." Then why have you mentioned it? "It's nothing for you to worry about." I wasn't worried until you called, now I wan't to know. "If you need to know. I will tell you. Forget I mentioned it." I am now in a state of suspense and dreading Wednesday! "Hi Andrew, I am still trying to complete my nomination paper. I called to see one of the people you suggested last night but they were not at home. When do you think they might be in?" Whenever I get over-excited about some random technical aspect of my job, such as the latest use of CMYK codes or a new innovative folding machine, my long suffering partner has a cutting sentence which quickly puts me back into my box. "Tractor Production is Up". I suspect this is one of those moments - but I was ridiculous excited to spend an hour at our fulfilment house a few days ago watching the various stages of our first quarter of a million GE newsletters roll off the presses. First is this smart machine which lasers on the addresses - but it doesn't just laser the address - it prints them two-up and automatically batches them into Royal Mail Delivery Rounds by scanning the postcodes. Next they are hand-trimmed in a guillotine which cuts 1,000 sheets at a time. And finally the folding end of the operation - once again the machine reading the postcodes and sending a signal at the end of each road or postal sector, enabling them to be bundled into delivery routes ready for Royal Mail. We don't need a better plan. We need a better Miliband. 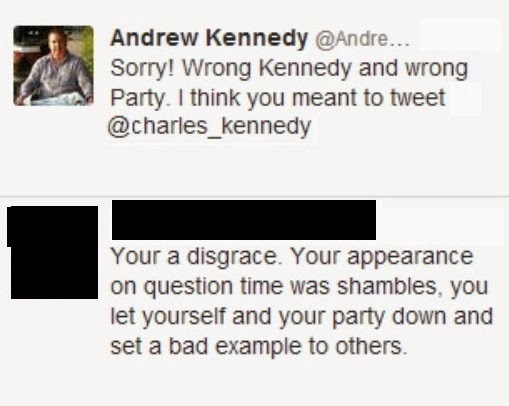 Wrong Kennedy. Wrong Party and the wrong your, too! Pehaps I ahould have added, "and the wrong your, too" ! I was saddened today to read that the Labour MP for Birkenhead, Frank Field, has been hospitalised after collapsing in Merseyside. My brief "get well" message on Twitter being retweeted by as many Conservative as Labour MPs is testament to the reputation in which he is held across the political spectrum. I first met Frank in the mid 1980s. His Birkenhead constituency was the neighbouring one to where I grew-up and first cut my political teeth, Wallasey. The early-mid 1980s in Merseyside was a tough and at times physically intimidating place for a Conservative. The rise of the Trotskyist Militant Tendency brought an aggressive, nasty and often violent edge to political debate. Derek Hatton, Tony Mulhearn and Terry Fields were running Liverpool and using it as a base to expand their influence and control into the neighbouring Boroughs, including my own. This was the height of their power, both within the Labour Party and the major industrial cities of the north. Talking to younger activists today it is hard for them to believe what politics then was like then. 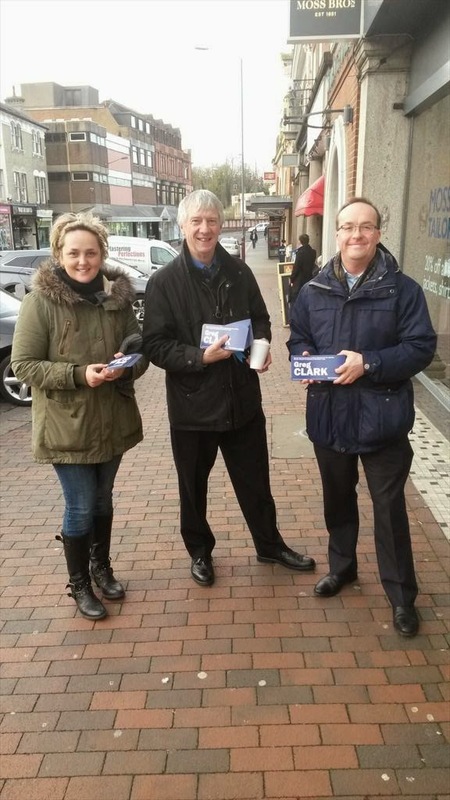 Canvassing for the Conservative Party in Wirral I would be regularly spat at, my car was once turned upside down, we had "Tory Scum" painted on our front door and hate mail and razor blades sent in the post. Neil Kinnock's leadership of the British Labour movement achieved little of lasting value, but when he started the process which ejected Militant from the Labour Party, he performed his greatest ever service to politics in the UK. At the time of Militant's dominance I helped form a group called "Liverpool Against The Militants". It was a cross party co-ordinating group including Conservatives, the sensible wing of the Liberal / SDP Alliance, business and taxpayer groups and many thousands of concerned residents. We provided resources, training and support to whichever moderate political party was standing against Militant-backed Labour councillors, including at times helping moderate Labour councillors fight-off deselection. At the height of the campaign we released a record (don't ask) and held a rally at the Pier Head attended by 5,000 people - though I am not sure if they came for the politics or to see Ken Dodd. Throughout this time, despite facing a fierce deselection attempt from entryists in his own CLP, Frank Field was steadfast in his opposition to Militant Tendency. Along with an decent and patriotic group of traditional Labour moderates, led by two local Labour councillors Ken Fox and Jim Edwards, Frank was the bulwark against Militant's attempted take-over of the Wirral Labour Party. Frank Field was obviously reselected - but his fight did not stop with his own survival. At the 1987 General Election my own MP, Lynda Chalker, was opposed by a Militant-backed Trotskyist named Lol Duffy. It was a dirty and bitter fight right to the end. Lynda's majority in that election was just 279. I have no doubt that the many letters written by Labour moderates to the local press exposing Militant did a great deal to secure those 279 votes. I have not seen nor spoken to Frank Field since, but I have always held him in the highest regard. Along with a small but determined band, he showed remarkable strength, dignity and personal courage in the mid 1980s. I wish him a full and speedy recovery. 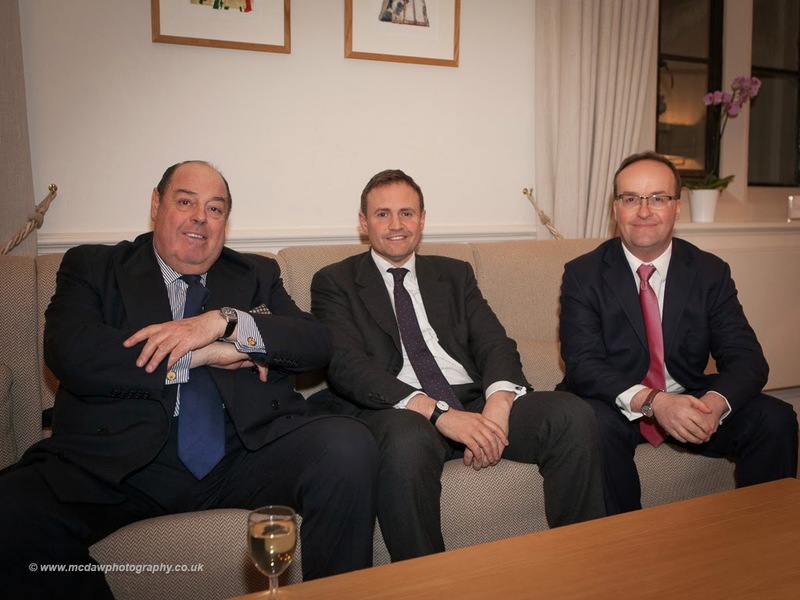 At Thursday evening's event with Sir Nicholas Soames we showed a short video of Tom Tugendhat out and about in the constituency. After a few tweaks, it's now going live. I am delighted that Tom has given me permission to launch it here. It's just 90 seconds long, but manages to capture Tom's decency, patriotism and commitment to service. 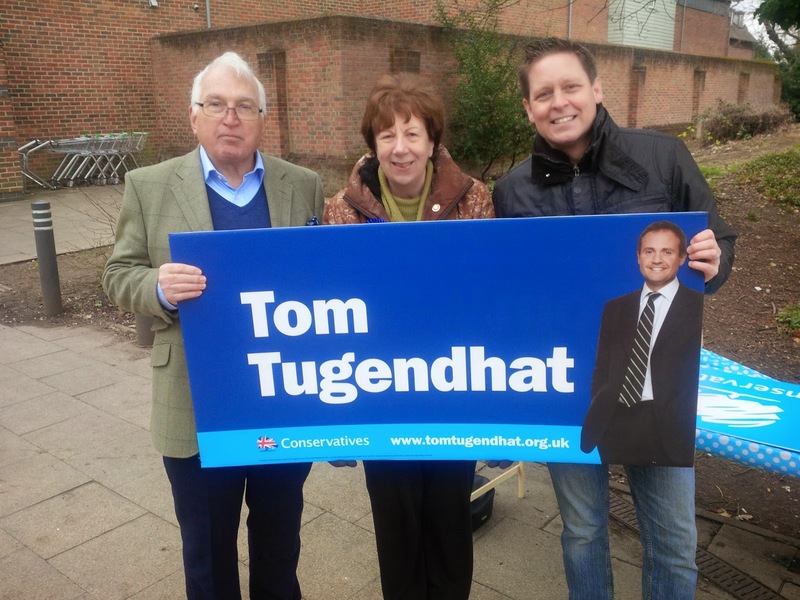 With the support of the people of Tonbridge, Edenbridge and Malling on Thursday 7 May, he will make an outstanding MP. I am proud to be part of his team. 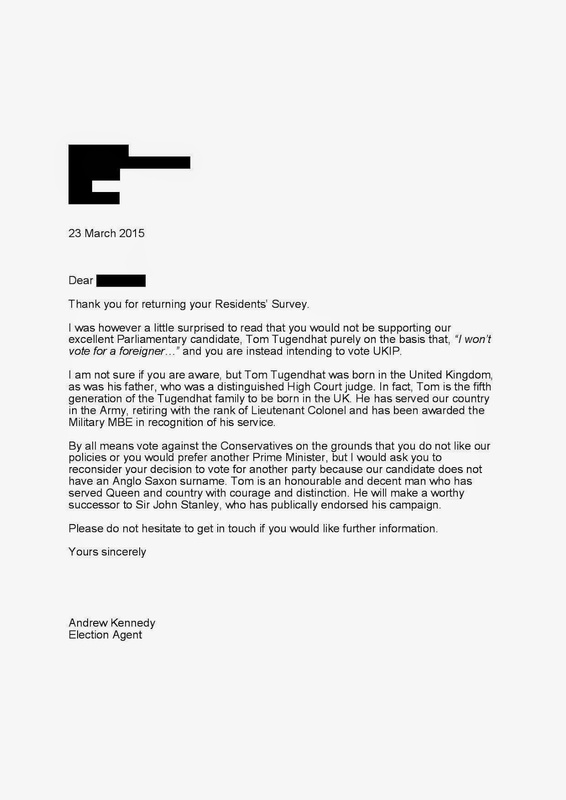 Promoted and published by Andrew Kennedy on behalf of Tom Tugendhat, both c/o West Kent Conservative Campaign HQ, Suite 3, Paddock Wood Business Centre, Commercial Road, Paddock Wood, Tonbridge TN12 6EN. What is this parochialism which is creeping into politics? Whenever a candidate is selected we hear a chorus of "he / she is not local / never lived in the town / how can they know local issues..."
In fact, I am not aware of any great national leaders or parliamentarians in the post war period who did actually come from the constituency the ended-up representing in parliament. Regular readers will know that one of my goals is to remove the pomp, formality and exclusivity too often associated with party membership, making it truly accessible to all. Over the years, with the support of others, I have tried to steer Associations away from formal and expensive black tie dinners, often to the chagrin of older/more traditional members. I remember as a young man feeling I had to attend the Association's annual dinner in order to "belong" but how the expense of hiring a dinner suit on top of the cost of the dinner and drinks ruined the evening for me and led me to question if I could afford to be a Conservative activist. I also remember some other younger members present at the dinner were wearing a normal suit (perhaps their only one) and how, whilst no-one commented or deliberately made them feel under-dressed, how uncomfortable they looked and felt. That experience must have been seared into my sub-conscious. I am often accused of being a spoil-sport or "denying the ladies a chance to dress-up" - and perhaps that is true, but to me the greater crime would be to allow another generation of young activists to feel excluded, unwelcome and "priced out", and I make no apology for that. I am also conscious of maximising income for the purpose it is intended; fighting and winning elections. About five years ago I recall being told by one well-to-do retired couple that "membership of the party had cost us almost £200 this month..." Not recalling a donation from them, I enquired why. The reeled off the money spent on the annual dinner; two tickets at £40 each, £40 on a taxi, £10 on drinks before the meal, £30 on wine, £10 on the raffle..... The reality was that only £20 of this money went to party funds, the remainder went to the venue and the taxi driver. However, in the minds of the members, this was "money given to the party" and probably affected / limited what they gave in other, more profitable ways. Recently we have developed a new way to maximise income from visiting speakers at a price everyone can afford, whilst returning a greater profit for the Associations than would be made at a formal dinner. 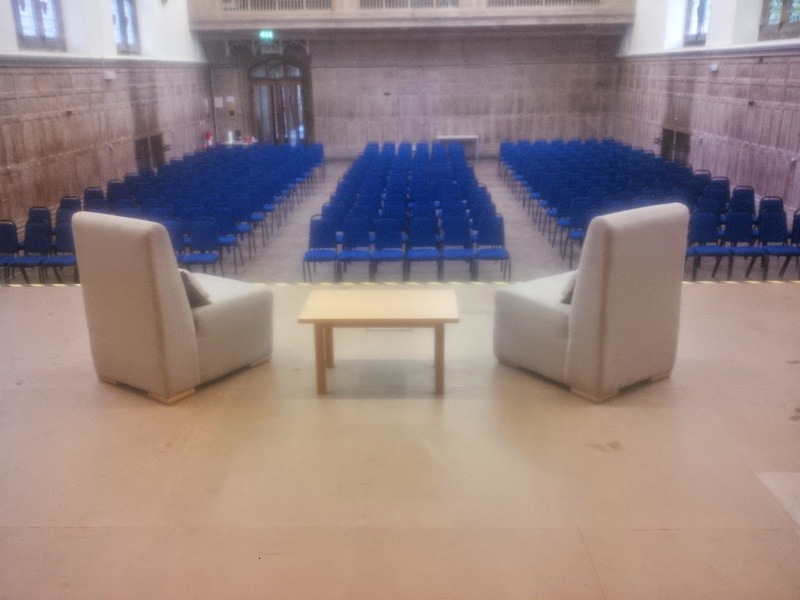 Our "Audience with....." format has proved hugely popular, and we are now planning our third and fourth! 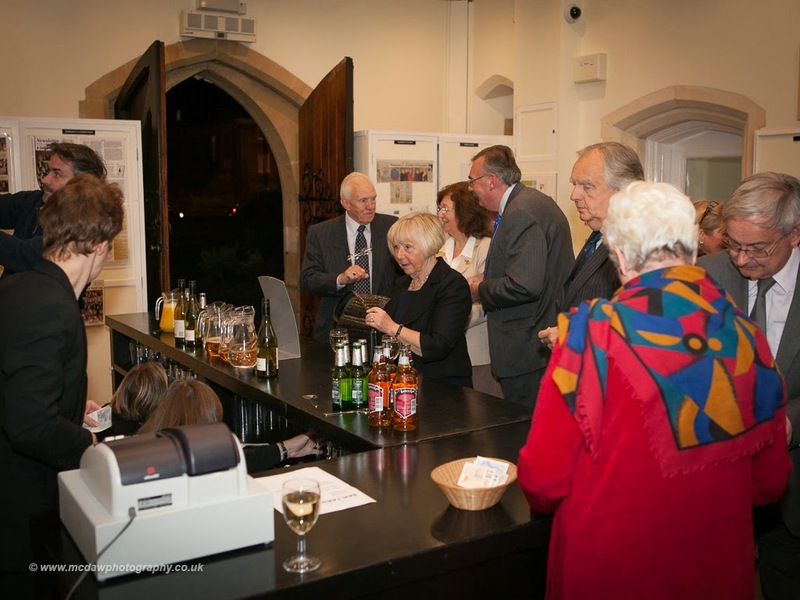 Last year we welcomed the formidable Baroness Jean Trumpington and last night it was Sir Nicholas Soames MP. The format is a stage show with the guest of honour being interviewed about their life by one of our local MPs. There's a cash bar (provided by the venue) and no catering or washing-up. The show lasts an hour, allowing people plenty of time to return home for a meal. With no food costs and only the venue hire charge to cover, we can charge a nominal £10 pp to attend, making £8 profit for the Associations. 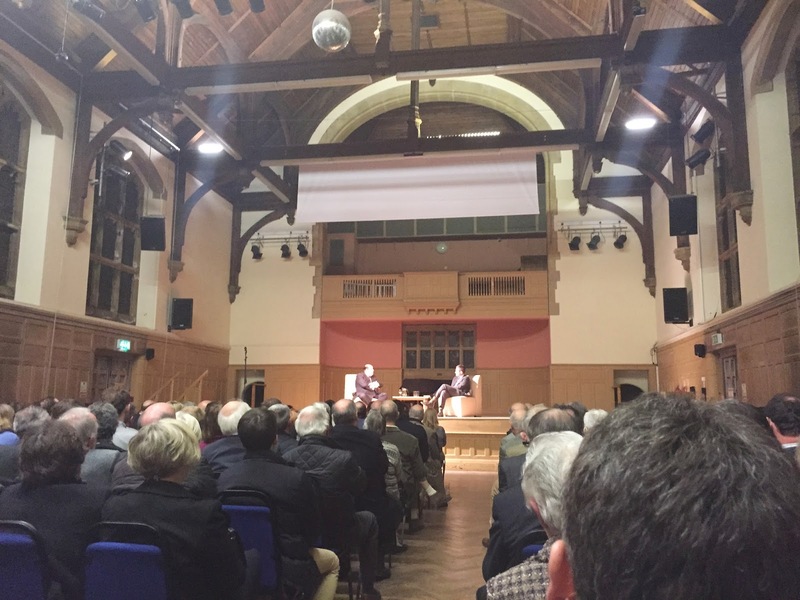 Last night's event (with 300 in the audience) made almost £2,500! 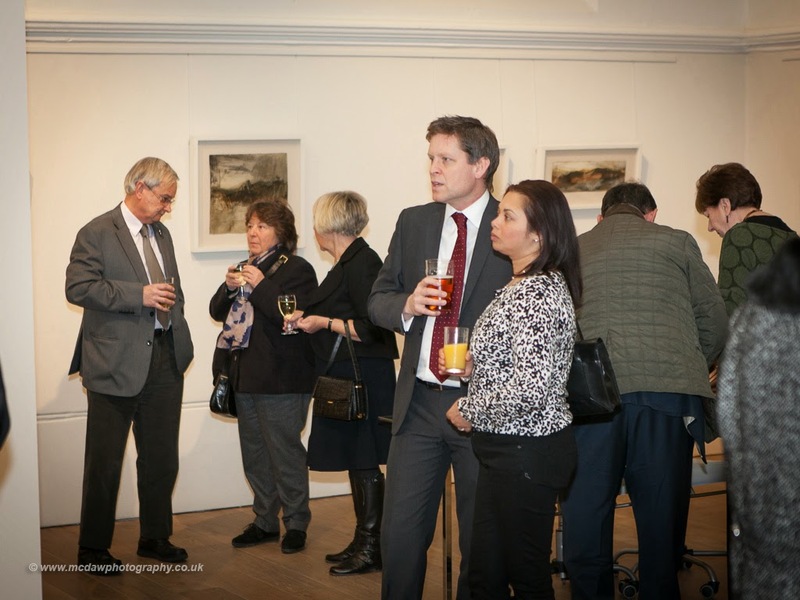 We hope future guests (post election) will be Simon Weston OBE and Lord Tebbit! Sir Nicholas was great value and spoke openly and movingly about his grandfather, his parents and his own life, both in the military as as a Minister and MP. He thoroughly charmed the audience with his candour and humour - and left them wanting more. and West Kent Group Chairman, William Rutherford. "Growing-up it seemed quite normal, at least to us. But slowly - as I got older - I realised that life in my family wasn't like other peoples' lives. I recall the moment I realised it was different. We were attending my nephew's baptism and when we came out of the church there were 8,000 people lining the streets of Westerham, cheering and waiving flags as we drove home. That was the moment I realised that "other boys don't get this when they go out on a Sunday." 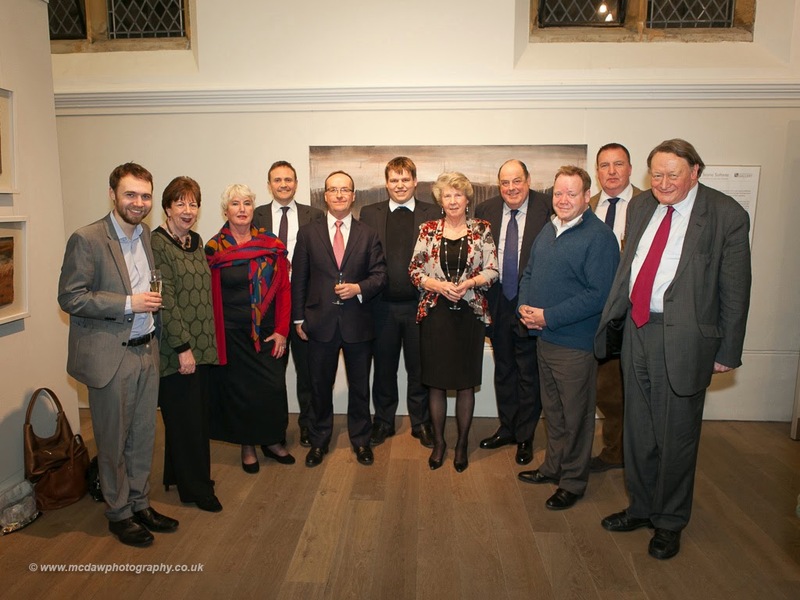 From left: Jon Botten, Janet Sergison, Sonia Williams, Tom Tugendhat, William Rutherford, Matt Boughton, Thelma Huggett, Sir Nicholas Soames MP, Steve Browning, AK and Sir John Stanley MP. 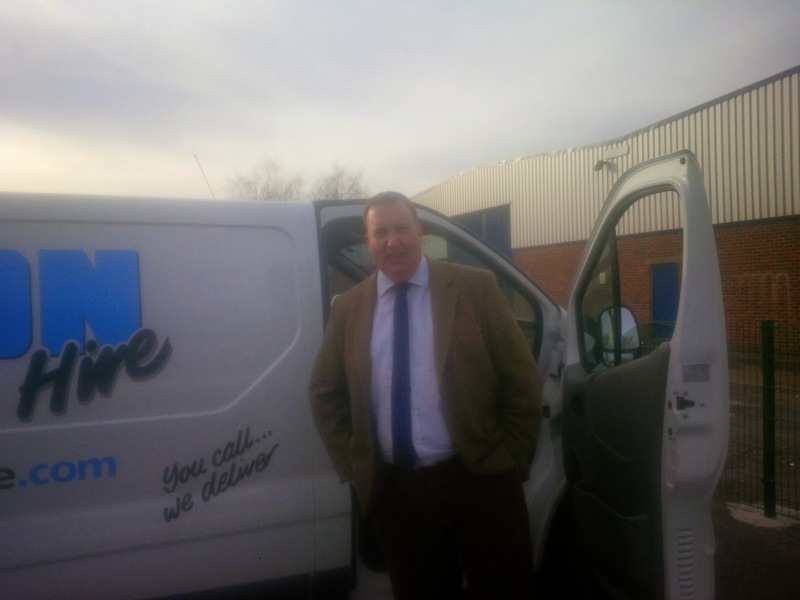 Our day commenced with an 8am call at the printers, in my now familiar battered van, where I picked up another pallet of EA1 (Election Address 1) to drop off at the fulfilment house to have them data merged and sorted ready for Royal Mail. On my way back to West Kent Towers I received a call from Richard Piper Griffiths, who is working for the fabulous Maria Caulfield, our Parliamentary candidate Lewes. 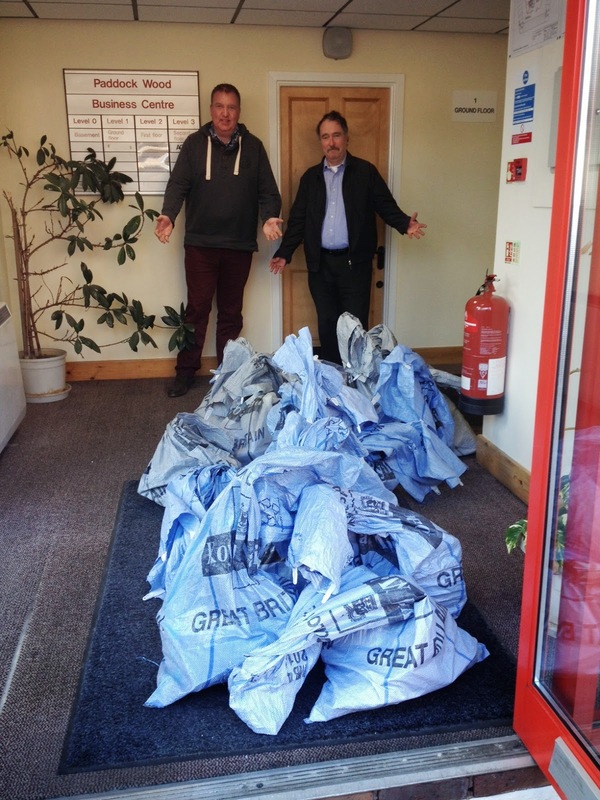 West Kent had stepped in at the last minute to print and mail merge 5,000 surveys after Maria's local printer let her down, and Richard had popped over to collect them. We regularly undertake activities like this (almost always without charge) to assist nearby target seats - and quite right too! Some people are critical at the time and energy spent in maintaining such a large scale organisation in West Kent, but doing so enables us to help and support the party's wider goals. 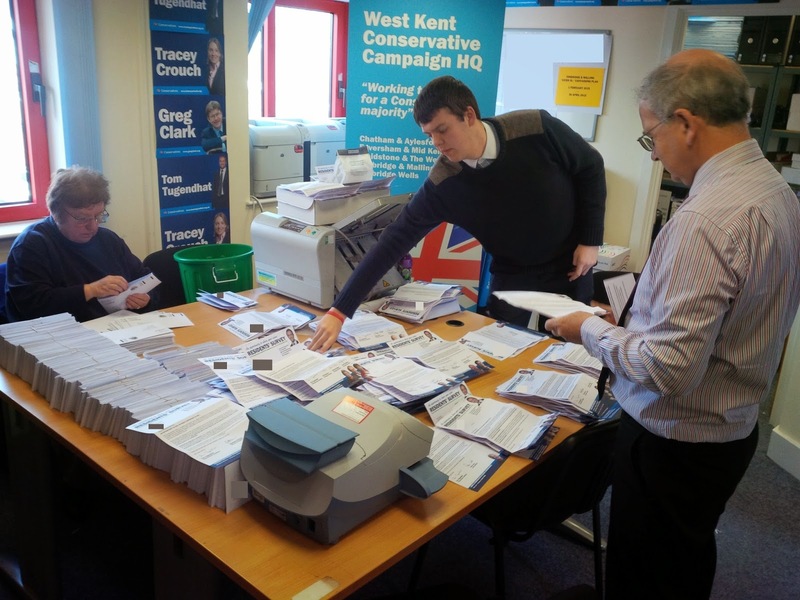 By way of example, in the last 12 months West Kent has provided approximately 3,000 "man-hours" of campaign support to nearby marginal seats as well as £15,000 of printing and professional support. None of this would be possible if it wasn't for our strong local organisation. 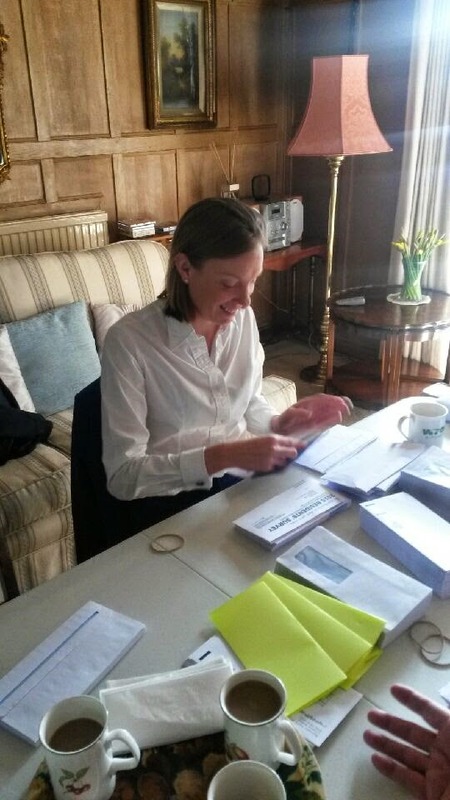 One of our internal goals today was to pack 25,000 Voter ID surveys for our new Parliamentary Candidate in Faversham and Mid Kent, Helen Whately. These had been mail merged and folded yesterday and were ready for packing today. It was all hands to the pumps to get this done in a day, and the first packing team were already hard at work at West Kent Towers by the time I arrived. 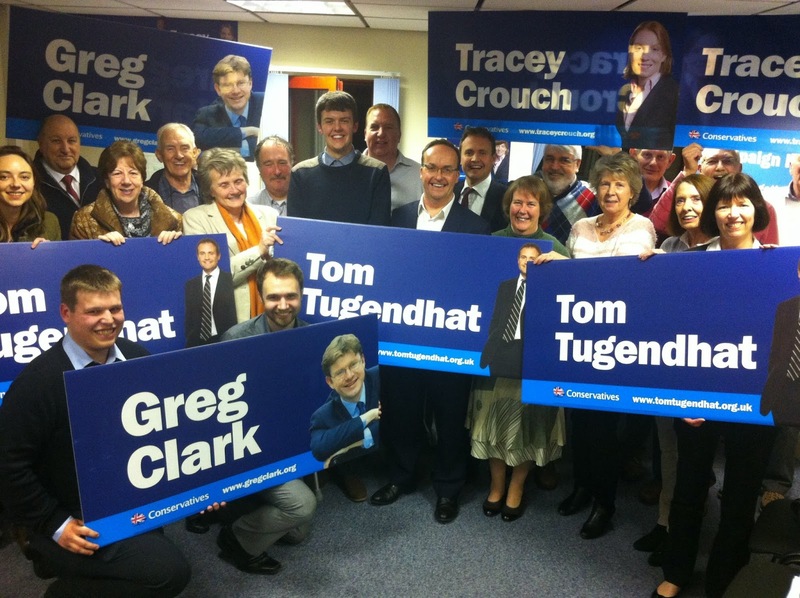 The team below consists of helpers from Tunbridge Wells, Tonbridge and Malling and Maidstone - all working willingly and enthusiastically for a constituency to which they have no formal connection and for a candidate they have never met; how lucky we are to have such mutually supportive volunteers. Pat Moss, Brian Moss, Owen Baldock and Chris Balock. And 15 miles away another packing team were working just as hard on Faversham and Mid Kent's surveys at the home of Chatham & Aylesford President Joyce Gadd. Joyce Gadd, Charles Gadd and Chris Parry-Waller. 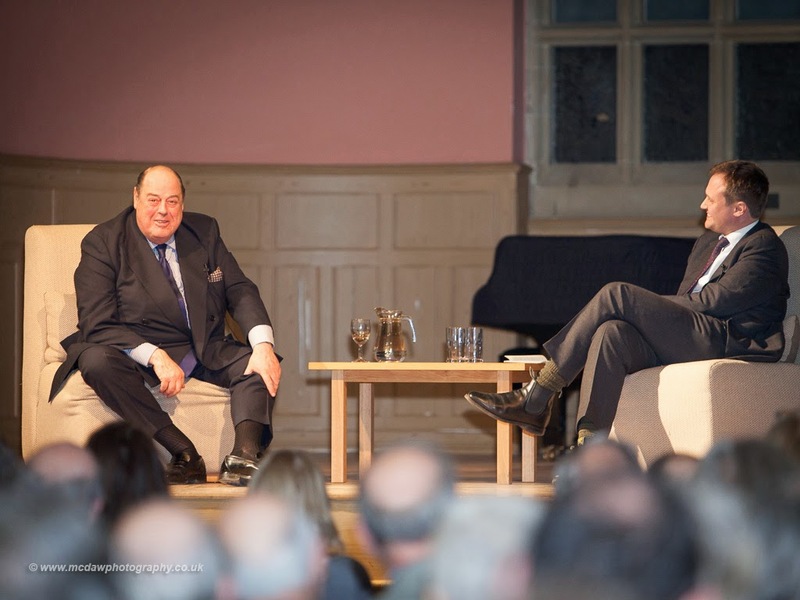 Finally, after checking the first 50 local government nomination papers I headed-off to Tonbridge School for our long-awaited fund-raiser "An Audience with Sir Nicholas Soames" which was fully booked with 300 guests. and here is another, an hour later! Apart from welcoming Sir Nicholas and hearing about his extraordinary life and family, we raised over £2,000 for Party funds. 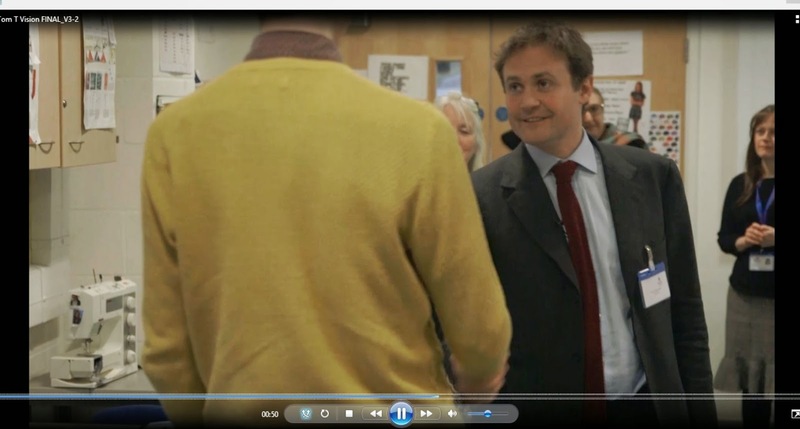 But something else very special and exciting also happened tonight; we launched Tom Tugendhat's Campaign Video "Our Best Days Are Still to Come." More about Sir Nicholas presentation and Tom's campaign video tomorrow. What a strange way to run a political party! A colleague who once supported Labour but has since "seen the light" still receives Labour Party emails, which he kindly forwards to me. The following bizarre correspondence arrived in his inbox yesterday. I suppose with many candidates turning down Blair's millions they need to raise money somehow. The good news: I'm not currently prime minister of the United Kingdom. I'm actually a Labour member from Glasgow. The better news: I'm doing all I can to kick my namesake out of Number 10, and I think it'd be really funny if David Cameron (me) helped Labour raise £24,000 in the next 24 hours to get rid of David Cameron (prime minister). I think I'll call it "David Cameron's £24k for Labour (in 24 hours) Challenge." All donations will help Labour win the election — and when we win, we'll get a brand new government, with good ideas such as raising the minimum wage, getting rid of the Bedroom Tax and scrapping exploitative zero-hours contracts. And in return, I will be able to show my driving licence without someone taking the mickey out of me. So, help David Cameron (me) get David Cameron (prime minister) out of Number 10. Donate to "David Cameron's £24k for Labour (in 24 hours) Challenge" now! Reproduced from an email sent by the Labour Party, promoted by Iain McNicol on behalf of the Labour Party both at One Brewer's Green, London SW1H 0RH. This post should be of interest to all branch or Association Officers. One of the West Kent Associations recently applied to NatWest bank for clarification over their "terms and conditions" for Clubs and Societies. The Treasurer noticed that there should be zero charges (apart from overdraft interest) on this type of account, but that the Association has been paying charges for the last 10 years. After a protracted exchange the bank confirmed that it had been applying charges incorrectly and agreed to refund all charges levied for the past 10 years plus interest (the maximum they are obliged to do so). Today, thanks to the eagle-eyed Treasurer, £2,800 was refunded directly in that Association's account. I have already noticed one other West Kent Association entitled to claim a refund (even charges of £17 pcm amounts to over £2,000 over a 10 year period). 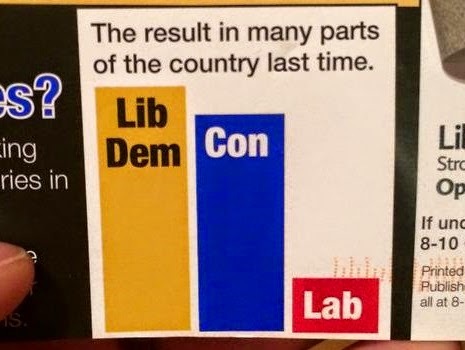 The Lib Dems are renowned for the mendacious bar charts showing that it's "neck and neck" and "only they can beat the Tories here". But this sample delivered in Kingston upon Thames today by Ed Davey really does plumb new depths. I just love the "result in many parts of the country last time". No doubt the sanctimonious blowhards will also be talking about "restoring faith and trust in the political process." Hat-tip to Cllr Nicholas Rogers for the story. Earlier this week I posted the early returns from a poll we are doing of Labour swing voters in Chatham & Aylesford. It made grim reading for Labour with 0 respondents opting for Ed Miliband as PM. However, this did cover just 60 returns - so perhaps things would improve for Ed. We now have 134 returns and Ed has finally featured. Here it is: 2%! Remember, this is not a random sample; these are previously identified Labour swing voters. The pace is hotting-up for us all, and without the help and support of an enormous team of helpers we simply wouldn't be able to cope. Times like these make me realise how fortunate I am (and our local Associations and candidates are) to have the support of such dedicated volunteers and staff. I am guilty of sometimes taking their goodwill for granted, so I wanted to place on the record how much they contribute and how much we all appreciate their commitment. To our Data Management Team - Thelma Huggett, Joe Mamo, David and Catherine Adams, George Mercieca, Owen and Chris Baldock, Sarah Hamilton, Sue Nuttall, Vivian Branson, David Elliott, Liam Keeble, Michael Payne, Mary and Tim Streater who between them provide 50 hours a week of data-entry cover. This week alone they are going to capure over 6,000 voting intentions and over 1,000 additional pieces of information. To Gill Levine who comes in each and every week for up to six hours at a time to manage our membership renewals and reminders. Often assisted at peak times by her sister Glynis Coates. To Max Martin who keeps the books and banks the cheques. 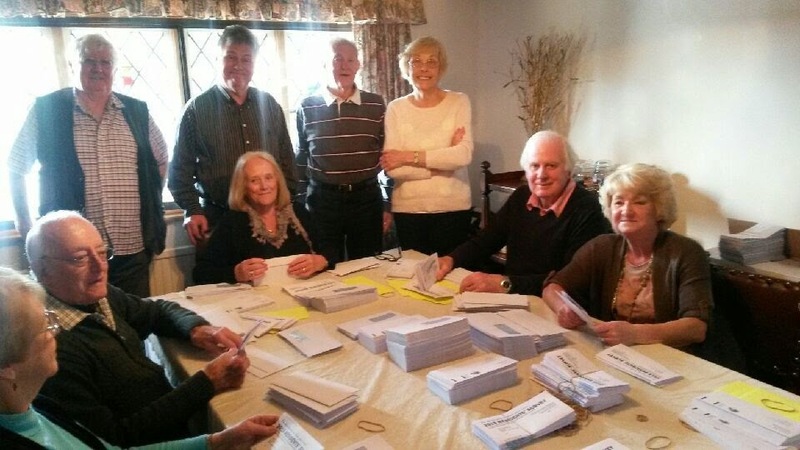 To Brenni Wilson, Joyce Gadd and Pat Gulvin who all run our "remote packing teams" - they open their homes and organise volunteers who, between them, have packed up to 50,000 envelopes in a single day. To my five sub agents, John Wilson, John Balcombe, Janet Sergison, Steve Sheppard and David Elliott who are handling all the local government nomination papers and share much of the adminitrative burdens of running an election campaign. 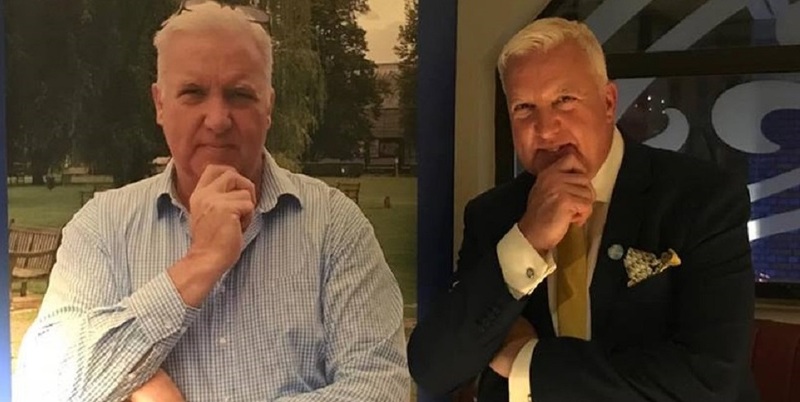 To the West Kent Chairman, William Rutherford, and the West Kent Treasurer, Allan Sullivan,who work furiously to smooth ruffled feathers and keep everyone content and legally compliant. 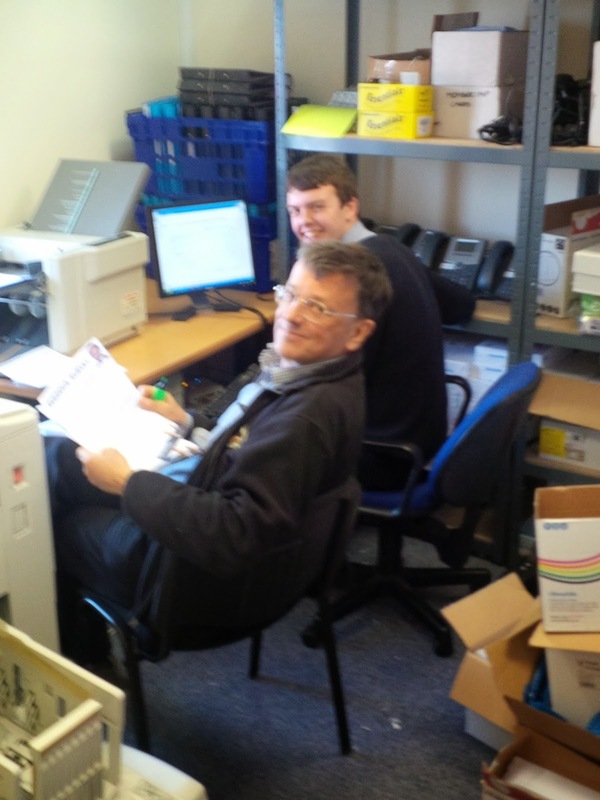 To our service partners: Howard and Andy at LionHouse who provide our IT and phone systems and always respond quickly to calls for help. And to our printer Jason Allen at DA Printers Ltd in Rochester. Although we pay them for their services, they both go above and beyond the call of duty and they never let us down. In particular, to our graphic designer Caroline Spenceley who patiently deals with my twenty phone calls or emails a day asking her to change designs or update copy or move headlines, jpgs or text "a little bit up the page." But perhaps most importantly of all; to Jon Botten and Matt Boughton, without whose dedication, loyalty, good humour and hard work we simply wouldn't cope. 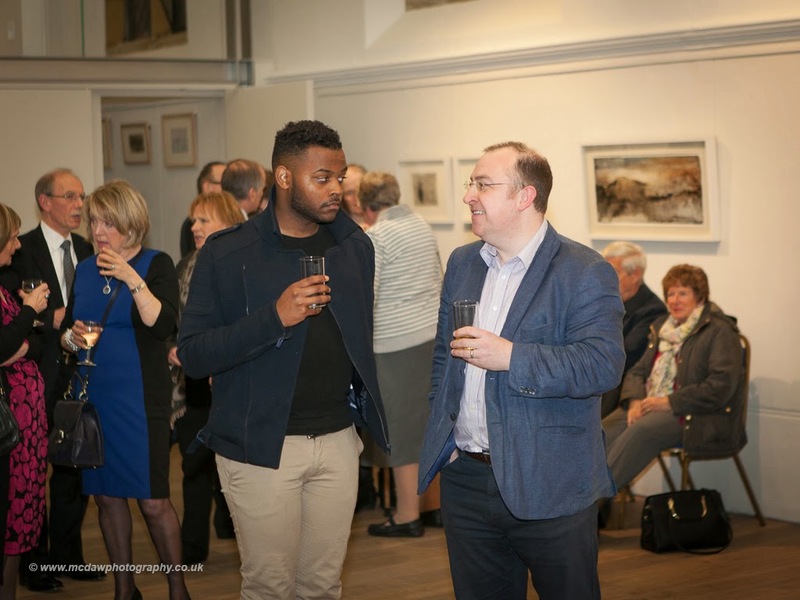 Jon has been with us for four years now and I have seen him grow from a shy and diffident intern to a strong and confident deputy, whose friendship I value and who, on a personal level, I trust implicitly. And Matt - whose first job post university was at West Kent Towers, and has developed into a confident and capable colleague, with an enormous capacity for work - much of it tedious and repetitive, which he undertakes without complaint. Two great guys who are worth their weight in gold. 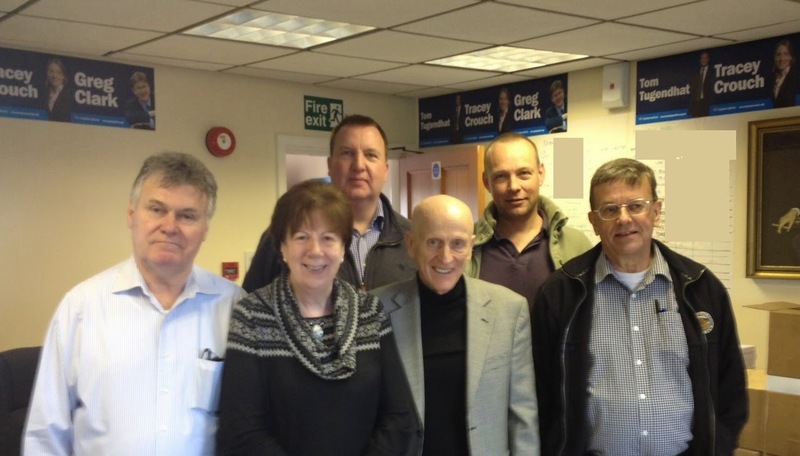 This post is a tribute to the core team who keep the West Kent Towers show on the road and as such I have not mentioned our Association and branch officers, councillors, candidates and activists who work tirelessly in their own fields, but without whom our work would not get done and we would not win elections. The Conservative Party is fortunate to have such a magnificent team. Say Hello to the West Kent Letter Opening Team ! Such is the volume of incoming mail that we now have a team of volunteers whose only job is to open and sort the post each day. This is what arrived this morning - and they're still opening it four hours later. If this doesn't scare the opposition.... then I don;t know what will! John Wilson (Maidstone & The Weald), Steve Sheppard (Faversham & Mid Kent) and David Elliott (Tunbridge Wells). Delighted to hold my first official meeting today with my sub-agents for Thursday 7 May, and what a fine body of men (and woman) they are. Seriously, I couldn't have a better team working with me in this campaign. Thank you all. 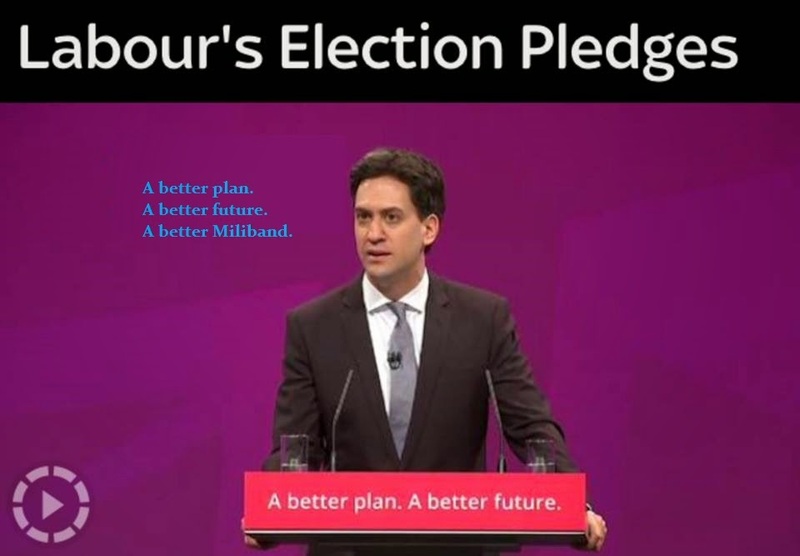 At least the only way is up, Mr Miliband! OK, I admit it's a small sample of just 60 voters with hundreds more to come, but the news for Chatham & Aylesford Labour doesn't get much worse. Actually, it does get worse. 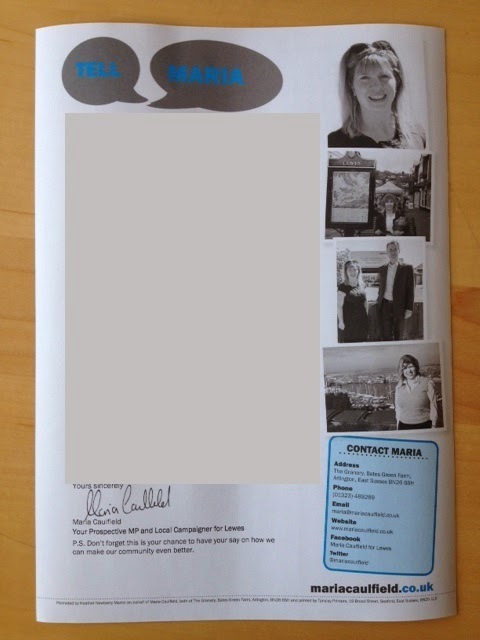 This particular sample was sent to former Labour voters who have previously indicated they might switch parties. Cheer up Comrades - the only way is up. 1. Why do so many people who demand a nice affordable home for their child or grandchild, almost always object when new homes are proposed in their village? 2. Why is it OK for an MP to be a Minister (which is a second job) but not OK for an MP to be a doctor or pursue other interests? 3. I wonder if all those people who complain about immigration changing our culture ever eat curry, pizza or noodles? 4. Do all those people who think the private sector should have no involvement in public service provision really believe their weekly shopping experience would be enhanced if the government ran every supermarket with no choice of brands or shops? 5. How can anyone who cheered and celebrated the success of our elite athletes at the Olympics, achieving what they did through specialist training and development, then oppose grammar schools offering the same opportunities for our academic elite? 6. If increasing taxes on tobacco is supposed to discourage people smoking, isn't it also true that increasing taxes on wages will discourage people earning? 7. Why do the people who complain most loudly about politics and politicians never join political parties to help bring about change? 8. Why is it that we oppose state control of media in various dictatorships yet in the UK have a hypothecated tax to finance our own state controlled broadcasting company? 9. Is it right that basic rate taxpayers, many struggling to make ends meet, should pay higher taxes to cover care home fees so that wealthy children can inherit their parents' estate? 10. I wonder if all those who move to Costa del Sol complaining that "immigration is ruining our country" ever wonder how the Spanish must feel when their local villages are turned into ghettos by gin, golf and "all day breakfast" ex-pats, many of whom don't speak a word of Spanish?